Will 2.4gHz wifi interfere with my 1090 Puck radio? I want to install a wifi AP antenna on my tower. The best spot is about 4 feet from my 1090 mHz antenna. It's going to be 1400 mHz of separation between signals and the wifi transmit should be <1 watt. some 2.4 GHz signal getting down to the Puck.. The 1090 antenna might reject a lot of out-of-band signals.. I'm just a little worried that I might have use a 1090 band-pass filter, if the front-end of the Puck is too wideband. Seems like front-end overload or de-sense would be the culprit, if it did happen. Has anyone heard about 2.4 gHz wifi interference with a 1090 Puck? We have a lot of locations with 2.4Ghz wifi nearby and don't seem to have an issue. Not saying you won't but we typically don't see any problem at all. I don't think there will be a problem. The Puck seems to have some filtering in the front-end (best I can tell by observation of pictures on the web). I think it does yes. Our own receiver has extensive front end filtering! I like those old style filters that have large adjustable elements. seems like a good reason to use to old-school filters.. I wonder what's inside that Amazon filter? Some micro strip? It's loss isn't that high, according to the posted test pictures. 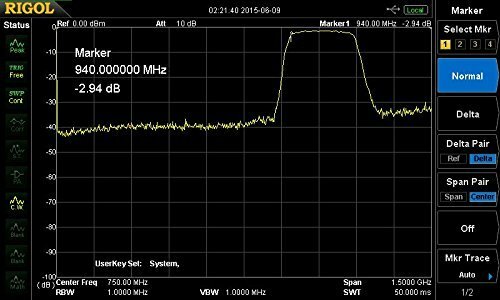 If it's an SMD filter, it's pretty good.. 1.65 dB of loss isn't that bad. This is the picture I don't like.. Only 3 dB down at 940 mHz. 940 is a busy band in the USA.. The new 2.4 gHz antenna has been installed and running at 230 mw since yesterday afternoon. About 24 hours ago. So far, there does not seem to be any negative effects on the 1090 Puck's range or it's data sharing flow. I'll post again in a few weeks, after testing with the power increased to about 1 watt. Well, it's May 2nd and I have not seen any problems with the 1090 Puck's range. After buying a 2.4 GHz 0.5 Watt amp and have the receive LNA section fail, I've decided to leave the router power as is.